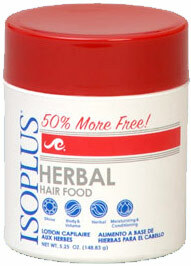 ISOPLUS HERBAL HAIR FOOD *Shine *Body & Volume *Herbal *Moisturizing & Conditioning DIRECTIONS: Section hair and apply to scalp. Massage scalp with fingertips. Brush or comb hair into desired style. Repeat daily for best results.